So here it is – it’s October. Autumn proper. All of that 20+ degrees in September nonsense is over and you’re partly glad for it; the untold wardrobe mistakes one makes in a warm September – the tube journeys alone are unbearable. It’s colder, wetter, and you can’t remember a time when you weren’t covered from head to toe in knitwear. It’s time for a deeply satisfying, deeply comforting pasta dish. Some time ago, CB and I took a trip to Borough Market and, after a long spell of spending silly sums of money on delicious artisanal bread and olive oil, found ourselves in dire need of some food but we were so ravenous that we could barely see straight. Fortuitously, we fell into Giuseppe’s at London Bridge and it was in this most unlikely of locations that we first tried a decent amatriciana. We’ve made a few different versions of this dish so far. All have been delicious but we’ve stuck with this one for its flavour. We used bucatini – a thoroughly delightful discovery; thicker than spaghetti, and with an intriguing hole through the centre, it holds onto all of your sauce to deliver delicious doughy spicy mouthfuls with each bite. We also added onion, against traditional methods, which we cooked on a low temperature in the bacon fat to release a little natural sweetness. We weren’t shy at all with the dry chilli flakes but that could be more to do with our spice-risk appetite. Finally, we added plenty of pecorino which, after some searching, we found in a pricey little deli close to where we live. If you haven’t tasted this nutty and creamy number before, get involved. Serve this with a large glass of red with your winter jumper and a napkin on hand. Heat the oil in a large frying pan and fry the pancetta until crisp. Move to a kitchen paper-lined plate and set to one side. Add the onion to the pan and saute for 7-8 minutes, until soft. Add the garlic and chilli and cook for a further minute, stirring frequently. Add the wine and let simmer and reduce for 3-4 minutes. Add the passata and simmer gently for 20-25 minutes. Cover partially to avoid any spatter. When the sauce still has 15 minutes to go, put the kettle on and cook the pasta according to package instructions in salted water with a drop of olive oil. Taste and adjust the seasoning of the sauce. Add the drained pasta, pancetta and 6 tablespoons of cheese. Mix and heat through for about 2 minutes. Sprinkle on more cheese to serve. yes, me too – perhaps we ought to start taking shares out in the pasta company! 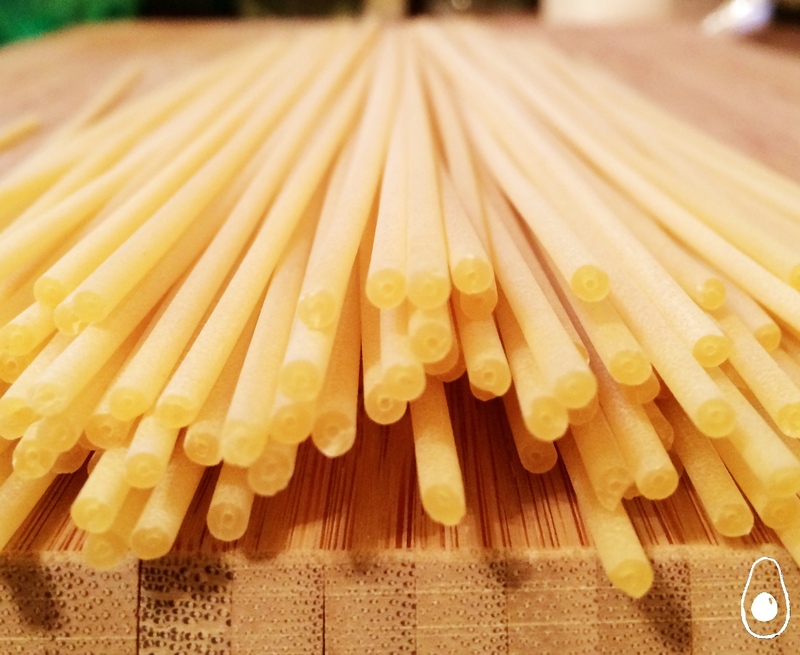 bucatini is a new discovery for us and must say I’ll probably never buy spaghetti again. This looks so tasty and warming! 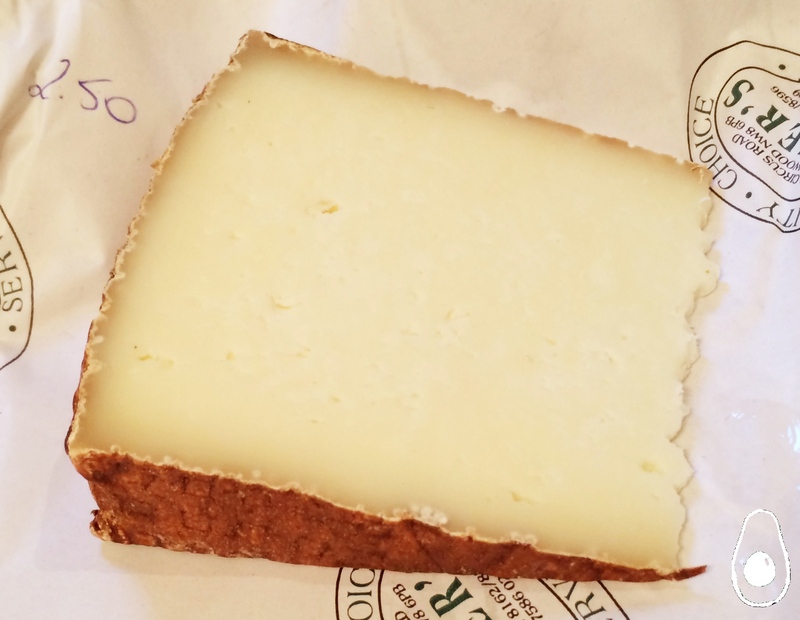 I love pecorino and bucatini, in fact I almost always use pecorino instead of parmesan. Thanks for sharing, I’m definitely craving a big bowl of pasta now! wow, I could definitely go for a large plate (or two) of this! My husband loves bucatini. It really makes sure that the pasta is as forward as the sauce. 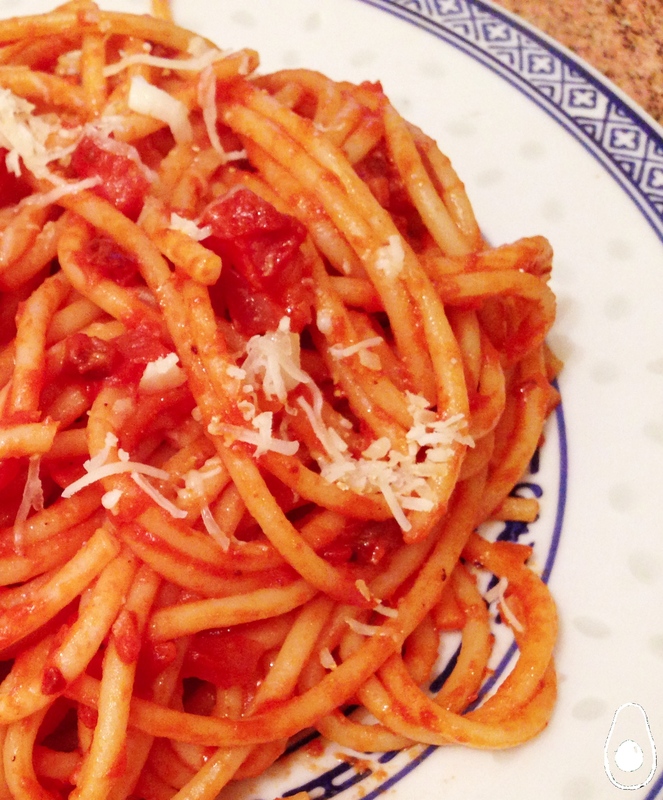 I love amatriciana sauce! An all time classic dish that is very tasty! Thanks for coming and linking up at The Weekend Social. All posts get pinned in our pinterest board! Please be sure to come back next week starting Thursdays at 9PM EST on culinaryflavors.gr ! I hope to see you there! Very interesting. Had not heard of bucatini until now!